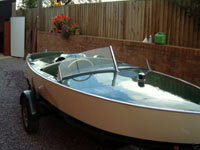 From time to time we are made aware of Simmonds boats for sale, either though our companion forum at Old Speedboats, or through owners contacting us here at the Register. Adverts are displayed free of charge, and details are received and placed here in good faith. The Register cannot be held responsible for any errors or misunderstandings that may arise from the published content. 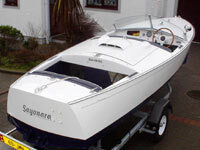 If you are interested in viewing or purchasing any of the boats featured here, contact either the Register via email or, where it is displayed, the owner direct. 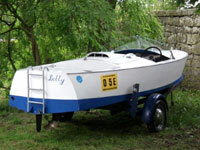 After a boat has been sold, the details may be left here for reference. This fully-restored Simmonds had an interesting history, and a fascinating future. To our knowledge, this was the first Simmonds to have been converted to electric power. Click the image for full details. 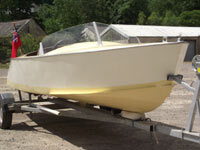 This rare opportunity to acquire a classic Simmonds motor launch in excellent running condition came up in late June 2011, and was sold within a matter of days. Click the image for full details. Having been the subject of a comprehensive eight-year restoration, 'Sayonara' is in beautiful condition, and ready to turn heads wherever she goes. She was sold in August 2009. Click the image for full details.. This very original Simmonds has been sold and is now enjoying a new life in the Dordogne, but the gallery of photographs offers useful inspiration to others attempting similar restorations and is left here as reference.